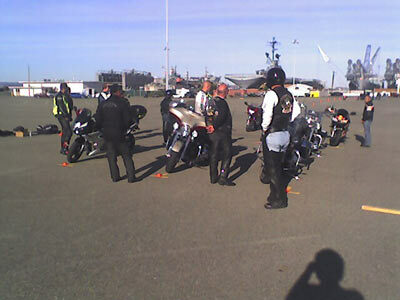 I was fortunate to snag a free spot in the 8AM - noon experienced rider course held on the old Alameda Naval Air Station, in the shadow of the USS Hornet. I was in a different mindset today then when I took the basic class more than 7 years ago. All I was concerned with the first time was not messing up so I could get my M1 endorsement. This time, I was on my own bike and since there were two instructors I felt like I got a lot more one-on-one coaching. The focus was on turning and I realized that I have a bad habit of looking at the exit of my turns and not through them. I will be focusing on that in the coming weeks. Even if you have to pay for it, it is well worth the price of admission. 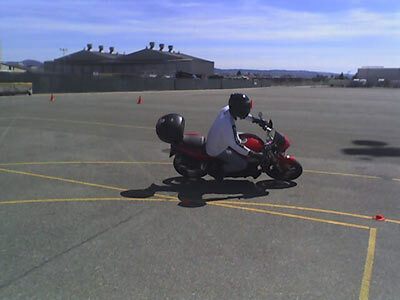 For more information on the class check out the Motorcycle Safety Foundation. One of the many breaks where we got to know each other. Coach showing us how it is done.